Sukhothai is a town known for its deep roots in historical significance. As the capital of the Sukhothai Kingdom, the province located in the lower northern part of Thailand promises a wide array of mesmerising ancient sites to discover. However, other valuable discoveries this town has to offer go beyond its historical aspects. There are the genteel culture, a relaxed yet fun-lving lifestyle, and culinary marvels that leave a lasting impression. 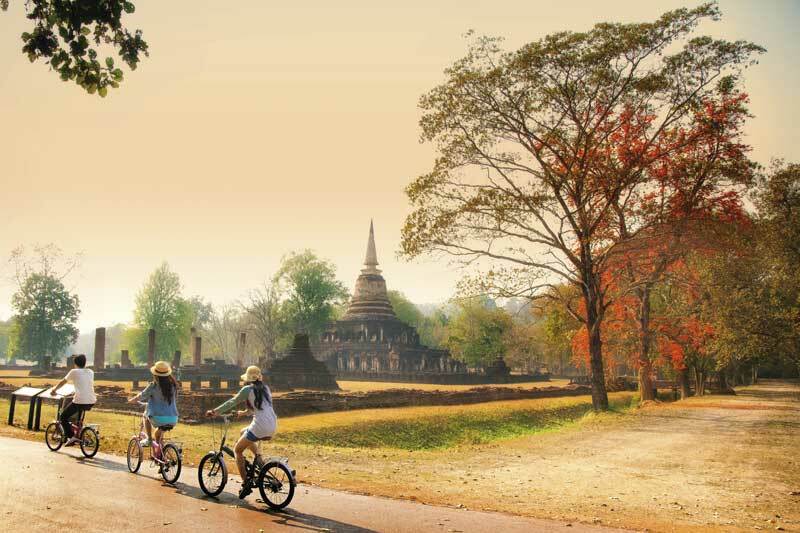 For a true Sukhothai experience, consider our must-dos while visiting the ancient capital. It is said that a person does not really make it to Sukhothai unless respects are paid to Phra Achana, the grand statue of Buddha whose seated image is in the “Subduing Mara” pose in the main hall of Si Chum Temple. King Ramkhamhaeng the Great ruled Sukhothai Kingdom, a valiant sovereign of the Kingdom of Thailand who was bestowed the title “The Great” for his abilities in war, politics, administration, and religion. He is also known for the Ramkhamhaeng Stele on which the first Thai alphabet was inscribed. His monument and statue is located inside the central zone of Sukhothai Historical Park. Cyclists can enjoy biking around the Historical Park and noting the admirable and exquisite details of traditional architecture and art, as well as learning about history. Many forms of art and its disciplines originated in Sukhothai, including the fine arts in which the Kingdom’s Buddhist sculptures see interpretation in superb traditional aesthetics. Conceptualisation of systematic urban planning and the creation of the Thai alphabet also began here. Sangkhalok glazed ceramics are the province’s most famous products, with trademark features of scalloped rims and bluish-green patterns, including expressive figurines. Visitors can learn to create and paint a Sangkhalok ware of their own using unique colours, lines and patterns as done by long-ago potters. 5 PAYING HOMAGE TO THE STATUE OF “PHRA MAE YA” (GRANDMOTHER GODDESS) AT PHRA MAE YA SHRINE Formerly located on Phra Mae Ya Hill, the shrine has been re-located to the front of the Sukhothai town hall. The venue is believed to have been constructed during the reign of King Ramkhamhaeng the Great in dedication to his mother, Princess Sueang. The shrine is highly respected by the people of Sukhothai and an annual festival is held in her honour. When visiting Si Satchanalai, don’t miss browsing through the wide array of intricate works in gold and silver meticulously done in the carefully-crafted Sukhothai style. These elaborate masterpieces are created by local artisans who have retained the cherished styles that’s passed from generation to generation. “Khao Perb”, or steamed rice flat noodles with its assortment of fillings, is the local dish found at Na Ton Chan Village only. Khao Perb is made with ground rice grains which are filtered to create a thick, white rice cream. It is later steamed on a thin muslin cloth, resulting in a translucent skin which serves as a wrap for tasty stuffing. This cooking is done in the same manner as another Thai favourite, Khao Kreab Paak Mor, Assorted vegetables, like Kan Song, ivy gourd, and star gooseberries are then stuffed inside the rice flour before being steamed. Once it is ready, the rolls are served with hot broth and a steamed egg. The colourful Khok Moo pick-up truck is a fun choice for travellers who want to experience the authentic lifestyle of the Sukhothai people -simple, traditional and gets you to the destination. With 40 years in the business of sweets and desserts, “Khanom Phing Mae Tim” (Thai mini cookies by Mae Tim) is best known for the rich and delicious flavour of their cookies distinctive through its unique method of using a charcoal stove for baking. As Mae Tim’s Khanom Phing is a top-selling product, customers have to queue up to purchase it. The bakery also has the charming feature of being known as “Khanom Phing Ngaem Pratoo Khai” (mini cookies sold through the folding door). Its popularity and large number of customers result in the bakery minimising the door opening to sell their products and lessen crowding. A sunset at the Sukhothai Historical Park is mandatory. Never to be missed, it’s the gift of a lasting impression. A glimpse of inspiring history outlined against the coming of dusk envelopes spectators in serenity – and the best way to end a trip in Sukhothai.